The Ruined Gamester was exhibited in 1837. 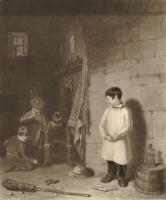 The title of the original painting was "Boys playing at Marbles". Its current whereabouts is unknown. "The most successful of his early works (1), the “Ruined Gamester,” was engraved and published by Mr. Dewhurst, a print-seller in Market-street (2), and in this form obtained extensive popularity. An etching of this picture by Duval himself appeared some time afterwards in the “North of England Magazine,” a short-lived periodical which existed in 1842 and 1843, to which he was a contributor. The illustration was there accompanied by a short poem (3), in which the half-humorous idea of the original picture, “Boys playing at Marbles,” was expanded by the author into an elaborate moral, and the ruined gamester was exemplified in the ruined speculative merchant, the spendthrift racing squire, the Indian nabob, the battered warrior, and other characters" (4). The etching which accompanies the poem was not an exact copy of the original painting, being the mirror image and not a particularly skillful picture. Charles Allen Du Val was not noted as an engraver. The picture became very popular and many prints were made, including a particularly fine engraving by George H. Every shown on this page. (1) The picture became very popular and many prints were made. 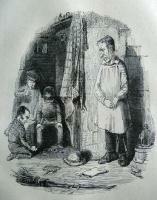 In 1844 a caricature of Lord Brougham appeared in the magazine Punch based on the painting. The article on Charles Du Val in The Art Treasures Examiner mentions a caricature of Peel (paragraph 7). (2) Unfortunately the success of the print of The Ruined Gamester did not extend to its engraver and publisher. On 10 August 1838 Dewhurst was declared bankrupt. Exeter Working Papers in British Book Trade History; 4 The British book trades, 1731-1806: a checklist of bankrupts by Ian Maxted. (3) North of England Magazine volume 1 (1842) pages 297 to 299. Ignis fatuus is the "Will o' the Wisp", a transient wandering flame of burning methane above swamps, traditionally luring the unwary to follow it to disaster. The author was of course Charles Allen Du Val himself. (4) Obituary of Charles Allen Du Val Manchester Times 22 June 1872.